ZENS has just launched a trio of new wireless chargers at IFA with aluminum bodies and at least one that is quite similar to Apple's forthcoming AirPower. The three chargers consist of a dual charger, a single charger, and a second dual charger with an Apple Watch charging puck. Of the trio, the most interesting one seems to be the last, as it can charge two iPhones and an Apple Watch simultaneously. Each iPhone and the Apple Watch get charged at full speed, namely 7.5 Watts for each phone and 5 Watts for the watch, which matches up to the reported 20-Watt output. A charging puck for the Apple Watch is built in, which means you don't need to supply your own. This helps keep down clutter and improve design because there is only one power cord to deal with. This makes ZENS' Dual+Watch very similar to Apple's AirPower, though it has a few specific changes. First, everything needs to be placed in certain locations, including the watch on the charging puck. AirPower has a bit more variability in comparison, but is still yet to be released and only supports the Series 3 Apple Watch. All three are carved from a single block of aluminum and are exceptionally thin -- the dual chargers are 8mm and the solo is 6mm. They support 7.5W fast charging on the latest iPhones, and are Qi certified. The ZENS wireless chargers will be available September 15th. The Dual+Watch will cost $99, the Dual comes in at $79, and the single charger is $49. 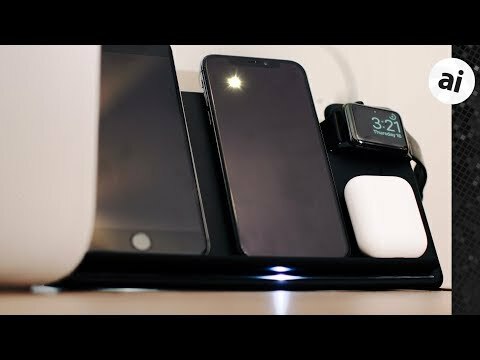 More to check out: Can this budget wireless charger beat Apple's AirPower? Well, no. It's not better than AirPower because it doesn't allow you to freely position things any way you want. It likely beats the AirPower on price, of course, but it also doesn't come with Apple's design prowess or superior engineering. That may not matter to most people, and hats off to them for coming up with a clever way to get three devices charged in a single device, but "better" as used here is subjective, not objective. I ordered one, great idea as it offered what I needed. However, the writer should have mentioned (and I should have noticed) on the product page https://www.makezens.com/shop/zens-dualwatch-aluminium-wireless-charger/ that the power cord is EU only. Now why wouldn't they offer a USA power cord and why would they ship one to the USA with an EU power cord. Emailed them about this thinking it was an error, only to notice on their site, and perhaps it wasn't there before about the power cord. An International company needs to offer the correct power cords.